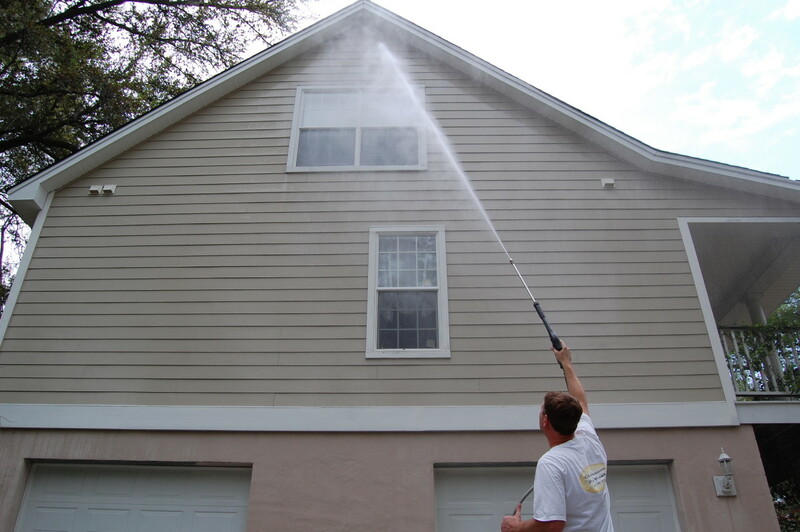 Pressure washing a tall two story home or even a three story or above building becomes pretty tricky pretty quickly. First it is nearly impossible to pressure wash from an extension ladder. If you have ever tried this or seen someone try this you know it is not only dangerous but it is just down right no fun! You are up on the top of a tall ladder spraying water everywhere, especially on yourself, and probably not even doing a very effective job of cleaning! You would ideally spray directly at the surface you are cleaning but from a ladder this becomes almost impossible so you end up spraying upwards. So you are, at best, delivering a glancing blow to the surface which will not do a very effective job in most cases. Moreover, you are likely to be spraying up into your siding planks or your breathing vents to your attic. In either case you are delivering a powerful stream of water to a place that is not designed to take on water. Think about it…why would the area directly under your roof line ever really get wet? So now you have water under your siding or inside your attic – exactly where you don’t want it! The way to safely clean a 2 story home is with low pressure and contractor grade detergents designed to kill mold and mildew and loosen up dirt so it can be rinsed away with low pressure – safely from the ground up to 3 stories. Our safe house washing methods allow us to remain safely on the ground and clean your soffits, siding and bricks without spraying water behind the surface – where it does not belong! There are a few instances when a ladder becomes necessary, and we generally have a few with us at all times, but these instances are rare and we almost never use high pressure from a ladder. Think about how powerful a machine a pressure washer is and then imagine using it 20 feet in the air with only 1 hand or no hands holding on….sound safe? Call Pressure Washing Sugar Land and get the job done right while you (and we) remain safely on the ground. Commercial pressure washing above two stories should always be left to professionals. Too much at stake to try to save a few bucks by hiring a handy man or having the maintenance man do it. Residential and commercial power washing services as well as roof cleaning and window cleaning in Sugar Land, Missouri City, and Stafford Texas. We have been in the industry for since 2005 and we can use our vast experience to make sure your project is done correctly the first time, at a great price, with no damage.